1. 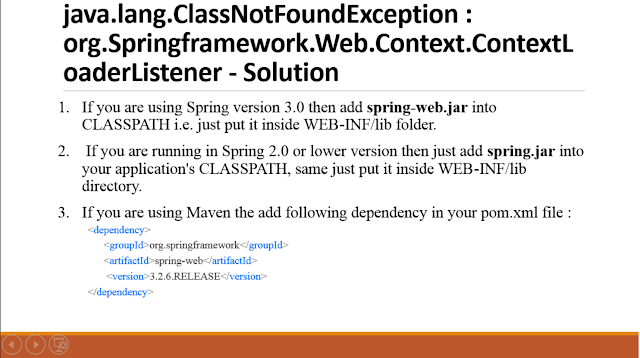 If you are using Spring version 3.0 then add spring-web.jar into CLASSPATH i.e. just put it inside WEB-INF/lib folder. 2. If you are running in Spring 2.0 or lower version then just add spring.jar into your application's CLASSPATH, same just put it inside WEB-INF/lib directory. 3. If spring.jar or spring-web.jar is already in CLASSPATH then your problem is not due to JAR but due to wrongly configured classpath. See my post how to deal with ClassNotFoundException to troubleshoot further. 5. If you are getting java.lang.ClassNotFoundException : org.Springframework.Web.Context.ContextLoaderListener error In Eclipse and Tomcat, then you can also try following steps to make sure maven dependencies are in CLASSPATH and visible to Tomcat's web application class loader. All you need to do is add maven dependencies into your eclipse project's web deployment assembly. Select Project, Right click and choose Properties. Click the "Add..." button on the right side. Choose "Java Build Path Entries" from the menu of directive type and click "Next". Select "Maven Dependencies" from the Java Build Path Entries menu and click "Finish". You will see maven dependencies added to the web deployment assembly definition by now. 6. If you are getting java.lang.ClassNotFoundException : org.Springframework.Web.Context.ContextLoaderListener error in previously working project and you are sure that you not done anything which causes this error then you can try "Clean Tomcat Work Directory" or simply "Clean..". This is supposed to discard all published state and republish from scratch. That's all about how to solve java.lang.ClassNotFoundException : org.Springframework.Web.Context.ContextLoaderListener error in Spring based Java web application. Mostly it's the case of missing the spring-web.jar file as hardly anyone is running with spring 2.0 now, but it's good to remember that you need to add spring.jar into the class path for older spring version and spring-web.jar for newer spring version, starting from Spring 3.0. Thanks for reading this article so far. If you like this interview question then please share with your friends and colleagues. If you have any question or suggestion then please drop a comment and I'll try to find an answer for you. P.S. - If you want to learn how to develop RESTful Web Services using Spring Framework, check out Eugen Paraschiv's REST with Spring course. He has recently launched the certification version of the course, which is full of exercises and examples to further cement the real world concepts you will learn from the course. what is the error you are getting? what have you been tried?